It's the smart shopper who knows that when it comes to saving money, timing is indeed everything. Similar to shopping after-Christmas sales for gift wrap, (or air conditioners in October, or gym memberships in June), there are lots more secrets to saving big at department stores — especially when ads feature the favorite phrase of any smart shopper: "INVENTORY CLEARANCE!" JANUARY: Look for annual January white sales for great bargains on sheets, bed covers, pillows and pillow cases. The arrival of new model TV's, digital cameras and furniture also means you can take advantage of department stores' willingness to unload their old inventory at bargain prices. The result is perfectly usable prior-year models for which you would have paid full price only a few months ago. While winter weddings are most popular in February (especially around Valentine's Day) in January you often find great bargains at wedding gown shops and wedding halls which are all primed and ready to cut you a special deal during one of the slowest wedding months of the year. Also look for great savings on carpet this month, a traditionally slow time (due to sloppy winter weather) for purchases on any type of new floor covering. FEBRUARY: With seasonal discounts on jewelry and gift sets of perfume and cologne during hot Valentine's Day sales, also look for great deals on everything from clothing to flat screen TV's and laptops later in the month during annual President's Day sales. Don't overlook similar bargains on bigger ticket items like refrigerators, washing machines, and other major appliances this month. Speaking of major purchases, also watch for fantastic deals on new cars, when dealerships traditionally use Presidents Day weekend to clear out their inventory by drastically dropping prices. Those who have been hit with an early spring travel bug will also find cheap airfares and travel bargains waiting at online travel agents offering great prices on quick winter getaways. MARCH: As spring arrives, there are great buys on winter coats, sweaters, hats, gloves, winter boots, and other cold weather gear. At annual Easter sales, also look for department store savings on kids clothes, women's fashions, as well as men's suits, shirts and ties as stores push the first of a new batch of warm weather clothing. From now until May, also continue to keep looking for travel bargains before the summer travel season kicks in. APRIL: Used cars are the big focus this month, so if you're looking for a cheaper alternative to the newer, higher priced models now is the time to enjoy even great savings as used car lots clear their inventory for the warmer weather buying season ahead. For the same reason, also look for huge sales on auto parts and accessories. Graduation season is just around the corner, as well, so keep your sights set on sales of laptops, cookware sets and dorm room kitchen essentials. Finally, April is also the time for great deals on vacuum cleaners as inventory clearances make way for brand new models coming out in June. MAY: May is mattress month as stores make room for newer models. Watch for cushy sales of up to 50% off (together with offers of free shipping) to lure in shoppers. Toward the end of the month, traditional Memorial Day sales begin on Friday and last throughout the first official weekend of the summer. If you've been putting off major purchases on electronics, laptops, flat screen TVs, (or if you want to get a head start on smart Father's Day gift shopping or last minute graduation gifts) Memorial Day weekend is the time to pounce at Dell, Best Buy, and other top electronics retailers. Finally, also look for the second greatest month for new car sales (the first during President's Day sales in February, and the best in December) by major dealers offering 0% financing and other incentives. JUNE: As Father's Day draws near, expect hardware stores and mega-centers like Home Depot to offer big Father's Day sales on hand tools ranging from rachet sets to cordless power tools, drills and sanders. June is also prime wedding season, so also check out the housewares section at your favorite department store to find great savings on dish sets, cooking utensils and other gifts for the home cook. If you've been putting off getting in shape, June is the month to finally buy a home treadmill as more people head outdoors to exercise in the warmer weather. Also look for local gyms offering deep discounts on membership to beef-up their summer sign-ups. JULY: This month's best buys include couches, sofas, living room or dining room furniture with savings up to 50 percent as stores clear their inventory to make room for the fall. Along with big 4th of July sales on summer party goods, swimsuits, sandals and beach towels, also plan on the end of the month for savings on barbecue grills and patio furniture as stores make way for big back-to-school sales in August. AUGUST: It's time once again for back to school sales offering lots of bargains on kids clothes, school backpacks and laptops. Also look for money-saving deals on camping gear and backyard pools plus other late summer savings on yard equipment, lawn mowers, playground sets and patio furniture. SEPTEMBER: Now is the time of year when big model appliances like refrigerators and washing machines are making their debut as stores attempt to clear their floors of old inventory at great savings. Also continue to look for great bargains on back-to-school laptops and school supplies during annual Labor Day sales, plus check out garden centers offering markdowns on shrubs, hedges, trees, and summer gardening equipment. OCTOBER: As the fall foliage season gets underway, pick up some cool bargains on fans and air conditioners this time of year. Toys are also on the bargain menu this month as stores gear up for early holiday shoppers. During Columbus Day sales, find the best bargains of the year on furniture, mattresses and recliners as early holiday shoppers look to spruce up their homes for the holidays. And don't forget scarily good savings during Halloween sales this time of year. Just remember that the closer it gets to October 31, the lower prices will plummet on Halloween costumes, candy and decorations. Also take advantage of the fall wine harvest season as wine shops and liquor stores try to clear their inventory with some of the lowest prices of the year on good quality wine vintages. NOVEMBER: Get an early start on holiday shopping with the first round of Veteran's Day sales this month. Of course, November is mostly all about that day after Thanksgiving, when hordes of shoppers begin to look for early holiday bargains on electronics like big screen TVs, laptops, and gaming consoles during annual Black Friday sales. Also expect steep price drops on jewelry, clothing and cologne-perfume gift sets on the first big shopping day of the holiday season. On the first Monday following Thanksgiving, look to online shops for even bigger savings (including free shipping) during Cyber Monday sales. DECEMBER: Happy Holidays! If you haven't already found some unusual bargains during annual Christmas sales, make the holidays even happier by putting off holiday shopping to the last minute. The closer it gets to December 25, the more drastic the markdowns. Of course, after-Christmas sales are the time to clean up on Christmas decorations, wrap, and gift tags to round off a full month of finding the best shopping bargains of the year. The Best Times to Buy Anything, All Year Round - Lifehacker.com guide with detailed tips and advice on when and where to find money-saving sales month by month. When is the Best Time to Buy...? - Kiplinger.com report with expert tips and advice on predictable and unexpected times to buy items by season, with related slide show. When Are the Best Times to Buy? 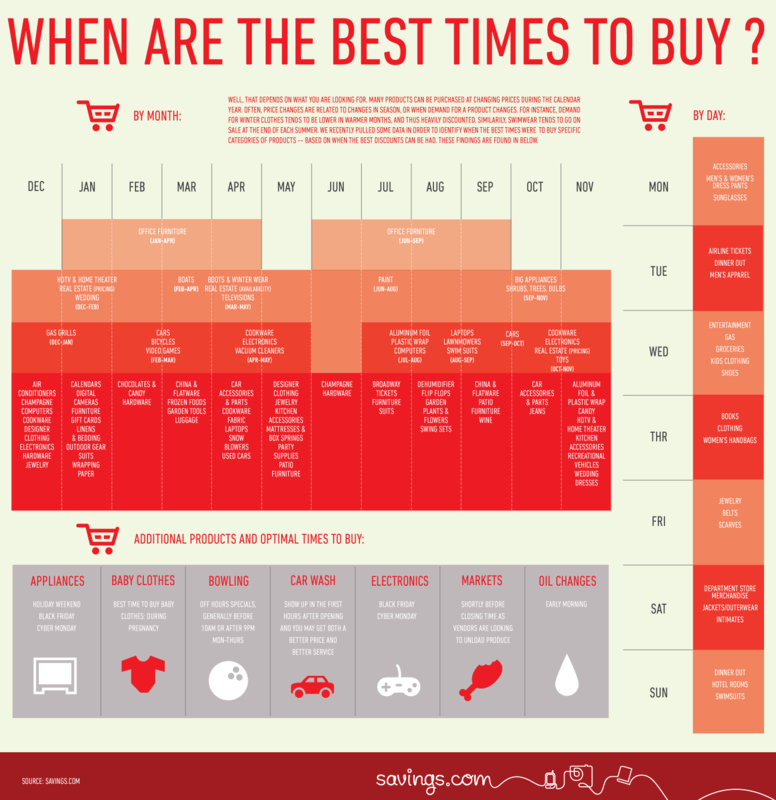 - A quick glance at an infographic from Savings.com showing the best times to buy anything month by month, including special looks at when to have your oil changed or when to go bowling.